Lipscomb represented one of the last remnants of the nineteenth-century songster tradition, which predated the development of the blues. Though songsters might incorporate blues into their repertoires, as did Lipscomb, they performed a wide variety of material in diverse styles, much of it common to both black and white traditions in the South, including ballads, rags, dance pieces (breakdowns, waltzes, one and two steps, slow drags, reels, ballin' the jack, the buzzard lope, hop scop, buck and wing, heel and toe polka), and popular, sacred, and secular songs. Lipscomb himself insisted that he was a songster, not a guitarist or "blues singer," since he played "all kinds of music." His eclectic repertoire has been reported to have contained 350 pieces spanning two centuries. (He likewise took exception when he was labeled a "sharecropper" instead of a "farmer." Between 1905 and 1956 he lived in an atmosphere of exploitation, farming as a tenant for a number of landlords in and around Grimes County, including the notorious Tom Moore, subject of a local topical ballad. He left Moore's employ abruptly and went into hiding after he struck a foreman for abusing his mother and wife. Lipscomb's own rendition of "Tom Moore's Farm" was taped at his first session in 1960 but released anonymously (Arhoolie LP 1017, Texas Blues, Volume 2), presumably to protect the singer. 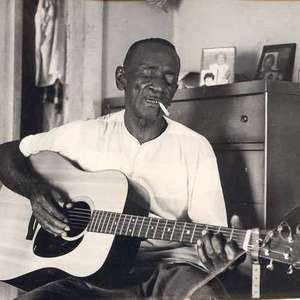 Between 1956 and 1958 Lipscomb lived in Houston, working for a lumber company during the day and playing at night in bars where he vied for audiences with Texas blues great Sam "Lightnin'" Hopkins,qv whom Lipscomb had first met in Galveston in 1938. With compensation from an on-the-job accident, he returned to Navasota and was finally able to buy some land and build a house of his own. He was working as foreman of a highway-mowing crew in Grimes County when blues researchers Chris Strachwitz of Arhoolie Records and Mack McCormick of Houston found and recorded him in 1960. Arhoolie Records (El Cerrito, California) has released seven albums of material by Lipscomb: Mance Lipscomb: Texas Songster and Sharecropper (Arhoolie 1001); Mance Lipscomb Volume 2 (Arhoolie 1023); Mance Lipscomb Volume 3: Texas Songster in a Live Performance (Arhoolie 1026); Mance Lipscomb Volumes 4, 5, and 6 (Arhoolie 1033, 1049, and 1069); and You'll Never Find Another Man Like Mance (Arhoolie 1077). Trouble in Mind was released by Reprise (R-2012). Individual pieces are included in other anthologies.